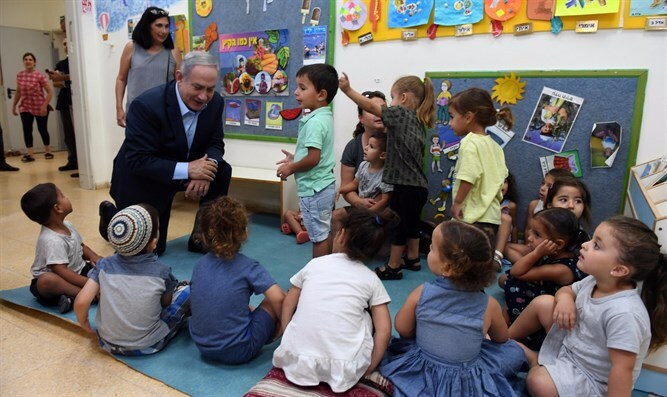 Prime Minister Binyamin Netanyahu sent a message to parents around the world about the incendiary kites and balloons launched by Gaza terrorists. "This is a message to every parent, to every mother and to every father," Netanyahu said in a video posted on his Twitter account. "The other day, Israeli preschoolers were playing in their yard. Out of nowhere, an innocent-looking balloon descended upon them. Yet this was no ordinary balloon." "Palestinian terrorists attached burning flames to it. They turned a child's toy into a weapon of terror. "'We smelled a fire!' one preschooler shouted, standing between a sand pit and a red slide. And these beautiful children were nearly burned alive. Their brave teacher led the children to safety just in time. "Thankfully, their precious lives were spared. "Now think about this," Netanyahu said. "What does it say about the terrorists that run Gaza that they try to burn Israeli preschoolers alive? "And so, when you drop your son and daughter off at school today, I want you to hug them, hug them especially tight. Tell them you love them. Tell them you'll always protect them. Then call up another mother or father, and tell them this story. This is what Israel defends itself against every single day."